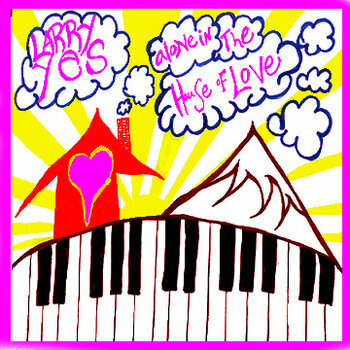 Larry Yes & the Tangled Mess explore the sounds and forms of psychedelic rock & roll through an uplifting spiritual lens. Larry Yes plants his feet into the center of the earth looks to the stars then closes his eyes and presses record on this truly refreshing album of songs of peace love and hope. Larry Yes finds his new voice on this album of songs of loss and transformation. This is the sound of the sun and trees and days spent wandering through meadows and sleeping in hammocks. Larry Yes writes 16 songs of love recorded with his friends whom he loves all over Portland in various states of heightened joy!! Larry Yes buys a 4-track and realizes that the sky's the limit on this 1996 stoner odyssey. Larry Yes finds a banjo and a tampura on the side of the rode, gets his heart broken, and records this lo-fi classic direct to a blade of grass. Larry Yes house sits at Miss Pamie's house, drinks tea, eats popcorn, and makes this noise-y ode to the piano that lives in the corner. Larry Yes plays a Bob Corn song, Bob Corn plays a Larry Yes song. Hearts are melted and a year-long Italian road trip begins. Larry Yes and the Tangled Mess tear up the World Famous Kenton Club on a Monday night at 9pm, opening for thee fantastic Yogoman Burning Band. Larry Yes creates a dreamy, folk-ish pop like substance all his own on this bedroom/living room recording. Tracked directly from the spirit realm & printed to tape with a smidge of delay for thee inner tender bear in us all. Larry Yes teams up with of thee Pall Jenkins of thee infamous Black Heart Procession to create a nearly almost all instrumental ode to day and night.